Managers of New York’s commercial and residential buildings know backflow preventer or RPZ testing is required in New York City. But most plumbers consider testing and repairing backflow devices a hassle. And when annual testing isn’t done, the result can be costly violations and device failure. Backflow Prevention of New York is a licensed, dedicated, and experienced testing and repair company. We do it all—the test, the filings and the annual scheduling. Custom software that tracks all information about your device. Call us to discuss our testing and service plans. As the preferred Backflow expert in New York City, our testing and service plans are the most reliable in New York. Backflow Prevention of New York is the city’s only dedicated Backflow Prevention vendor. 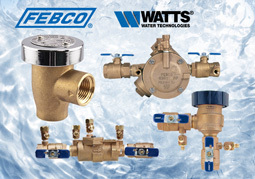 We’re licensed Backflow Prevention Device Testers and NYC Licensed Plumbers. We’ll make sure you’re up to code and avoid costly violations. Every point-of-use backflow preventer installed must now be tested by a licensed “Backflow Prevention Device Tester” before it is put into use? Each device must be tested annually, with the test filed with the NYC Dept. of Buildings?